Co-founders Ralf Pardemann and Laurianne Korte decided to bring this German adventure to Cape Town after Ralf saw what a huge hit the themed glow-in-the-dark mini-golf course was abroad. Situated at The Gallery in Milnerton, Glowing Rooms is easily accessible via various main roads and highways from Paarl to Atlantis and the Southern Suburbs. Once you enter Glowing Rooms, a galaxy adventure awaits. At the door, a huge mechanical model resembling the operations system of a spaceship is the first thing you see. Walking up the stairs, the neon green walls with a 3D mural of outer space grabs your attention and leads you to the lobby. At the top of the staircase, you are greeted by the friendly Glowing Rooms team manning the retail section. Here you can find all the goodies you need to glow. “All the retail that we have, the apparel, actually does glow in the dark,” says Laurianne with an ecstatic smile. Think glow-in-the-dark hats, hair, armbands, glow sticks and of course, the famed selfie-stick, which happens to be one of the best-selling products at the glowing hotspot (because who’d want to glow without a selfie to show?). What’s more is that the pictures taken inside the course have a magic 3D effect. 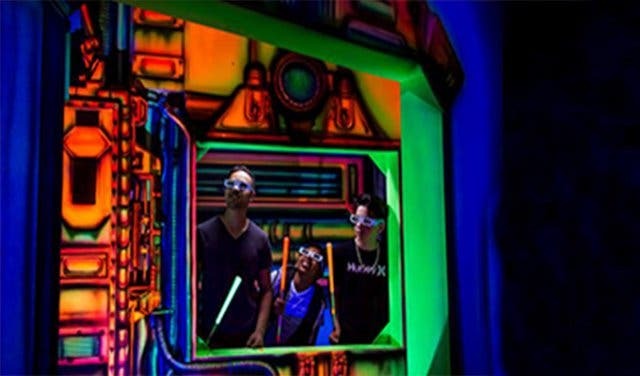 So once you’ve completed the course take a look at your Glowing Rooms memories, with your 3D glasses and watch your memories come to life. Alongside the retail store is the Glowing Rooms café, which serves pre-packed nibbles, slushies, coffee and tea, keeping you refreshed as you embark on your journey to outer space. 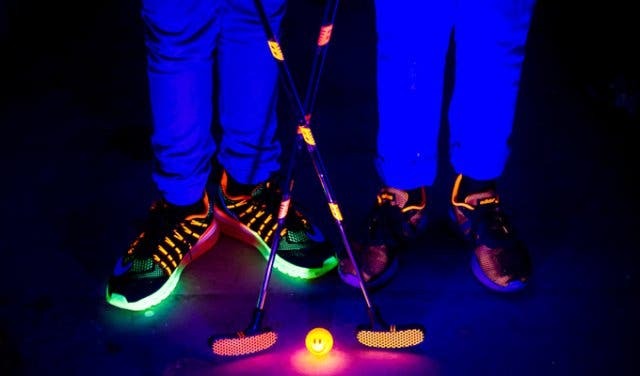 Once you collect all your equipment including glowing golf clubs, 3D glasses and other glow material available for your perusal, Laurianne issues you with a mandatory Glowing Rooms SA indemnity form. And when all the admin is out of the way… Glow ahead! Entering the 18-hole course, the very first hole awaits you at the door. The sounds of outer space and mechanical machinery haunt your journey as you start questioning the illusory effects that Glowing Rooms has on you. You start feeling the walls to figure out how much of this is real and how much these 3D glasses are suspending your reality. You feel like an astronaut as you subconsciously alter how you walk, slowing down your motion, taking larger leaps while being deceived by the edges of the course. Nevertheless, you continue to make your way through hole one, hole two, hole three and by hole four, you start to accept your perceived reality: I am playing 18 holes of mini-golf in outer space. Glowing Rooms SA is fun for the whole family. “The youngest player we’ve had so far was one-and-a-half and, of course, he had a little bit of help from daddy," says Laurianne with a chuckle. “And our oldest player was 84, and she had a jolly good time." Tip: Glowing Rooms is an ideal space for a get-together, team-building or a celebration. The themed event room is available for bookings, with its own tables and chairs. 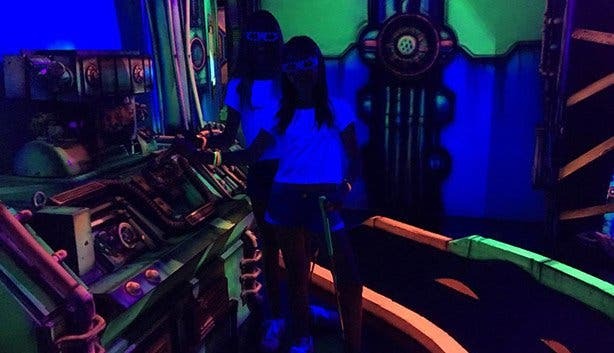 This space features some incredible glow-in-the-dark 3D murals on the walls, disco and laser lights and a Bluetooth-enabled sound system to connect your device so that you can listen to your own music. 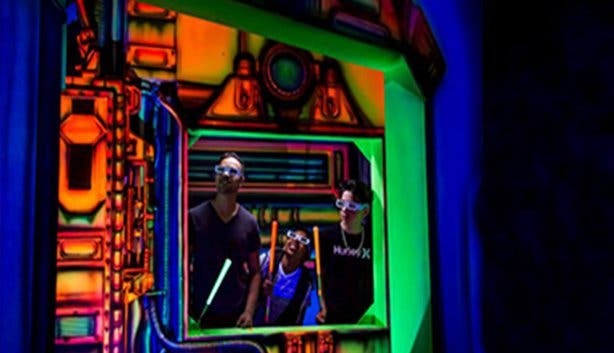 Participants using the event rooms will receive a glow-in-the-dark pack which includes the 3D glasses, a pack of 50 glow sticks – which can be used interchangeably as chokers or bangles – as well as a pack of glow-in-the-dark crayons to draw glowing patterns on one another and a slushie each. The event room costs R230 per person with a minimum of 10 people to book and this will give you two and a half hours of exclusive use of the room (this is subject to change without notice). Note: The last players have to be in an hour before closing, as it takes about an hour to complete the course. 2019/2020 School Holiday Special: Have a look at the 2019/2020 school holiday special prices at Glowing Rooms. To see any new specials they may have, visit their website. School holidays: Opening hours are subject to change. Please refer to their website or Facebook page for more information. Here is the ultimate list of activities for all 20-somethings in Cape Town to do. Try something different this year with these suggestions for your end of year work function.